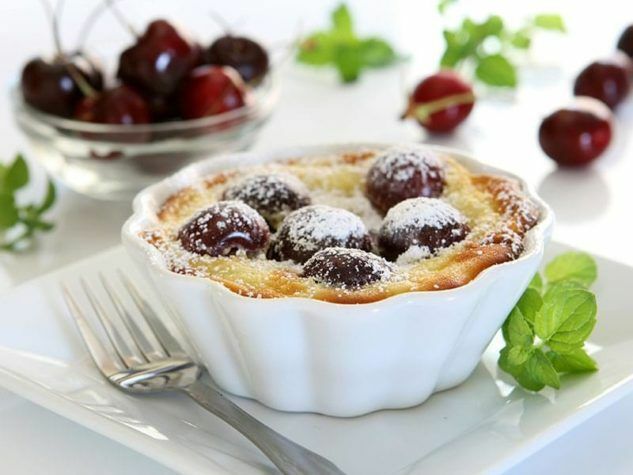 To make the most of freshly arrived cherries in the market, I’d like to share a very different dessert with you this week, known as “clafouti”. Native to the Limousin region in France, clafouti gets its unusual name from “clafi”, a dialect word that means “filled” (with cherries). The classic version of this flan is made with unpitted cherries, not because the cook is lazy, but because the pit provides a special flavour to it. This mildly sweet but nourishing dessert that can be served either hot or warm, contains 8 g of proteins per portion. Complete the meal by adding some prosciutto and mango slices as an entrée. Try our recipe for Cherry Clafouti. Originally published in the Journal de Montréal on May 31, 2008.